Superstructure laminations. This is a bit hard to visualize, it even took me awhile and I really have been all over this and other 48' Kadey-Krogens. What you are looking at is the super structure "upside down". The opening you see is actually the hatch into the cockpit lazarette from below the deck. OK, no worries, come aboard and I can explain it all! 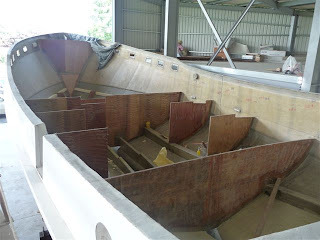 The bulkheads are installed, glassed in and sealed with resin. The stringers can be seen running bow to stern. They will serve double duty, stiffening and supporting the engine and providing a vital link, engine to hull. The engine provides rotational torque to turn the propeller then the propeller produces thrust which in turn is transfered back up the shaft to the engine and through the engine mounts to the stringer and finally to the hull providing....voila, forward motion. 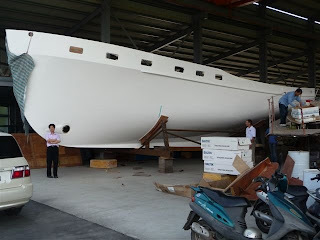 Not unlike a sail boat where the mast transfers energy to the hull and again, forward motion. 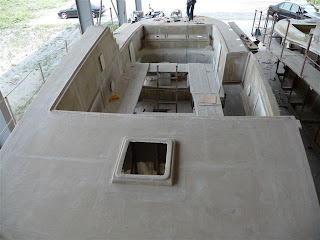 Our new hull leaves the mold and is prepared for the move to the finishing facility. 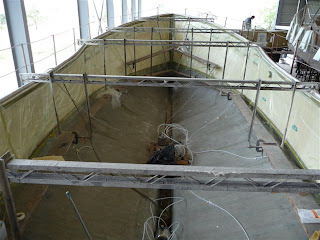 The lay up of our 48' Kadey-Krogen North Sea. This is a forward view, the lay up crew are preparing to do the "vacuum bagging" which infuses the laminations with resin.